For children who have turned four by September 30th. 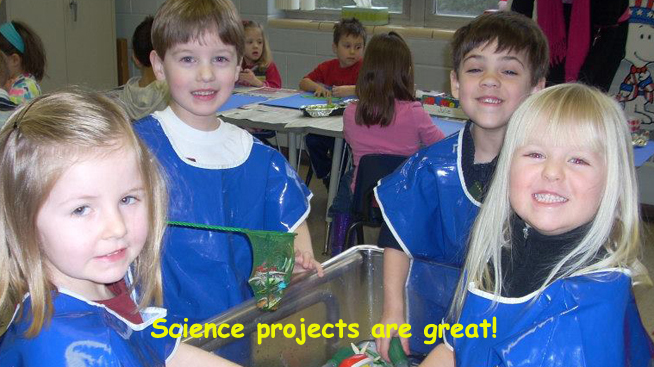 This enhanced and creative curriculum concentrates on kindergarten readiness. Our definition of kindergarten readiness is academic readiness: the ability to identify commor shapes, recite the alphabet, recognize rhyming words, identify his/her birthday, count to 20, learning numbers 0-15, recognize primary colors, recognize basic directional words such as up/down, in/out, etc., pre-writing and writing abilities. Our young authors create an "All About Me" book which highlights their accomplishments during the school year. Social skills are important too so we learn to play cooperatively with peers, follow basic rules, respect others property, share, communicate, wait for his/her turn, ask for help, and demonstrate independence from his/her parents. We are also proud of our "learning centers" because they allow the children to acquire and refine fundamental skills. We continue to keep in touch with current kindergarten programs to provide the necessary skills your child will need for a smooth and positive transition. This is evidenced by the enthusiastic participation of our students and their continuing progress and praise by their ensuing teachers. We make learning fun. It is recommended that children attend three or four times a week. Concepts taught in the 4's program follow the State preschool Standards and exceeds the expectations and requirements of local kindergarten programs. Student-Teacher ratio 10:1. Maximum class size is 18. This class meets two or three times a week. Either Monday-Wednesday mornings /afternoons or Tuesday-Thursday mornings / afternoons with a three day program available by adding Fridays. A four day program is available mornings or afternoons and it includes all 4 extra-curricular classes: Exploring the Arts, Counting on Math, Discovery Play and Stepping into Reading. It is possible your child will have a different Friday teacher. The two day program still provides necessary fundamental skills in creative, stimulating sessions. 9:30 - 10:15: Center Time - 3 to 4 centers, chi ldren rotate to each station every 15 minutes.